We develop a theoretical approach to quantify the effect of long-term trends on the expected number of extremes in generic time series, using analytical solutions and Monte Carlo simulations. We apply our method to study the effect of warming trends on heat records. We find that the number of record-breaking events increases approximately in proportion to the ratio of warming trend to short-term standard deviation. 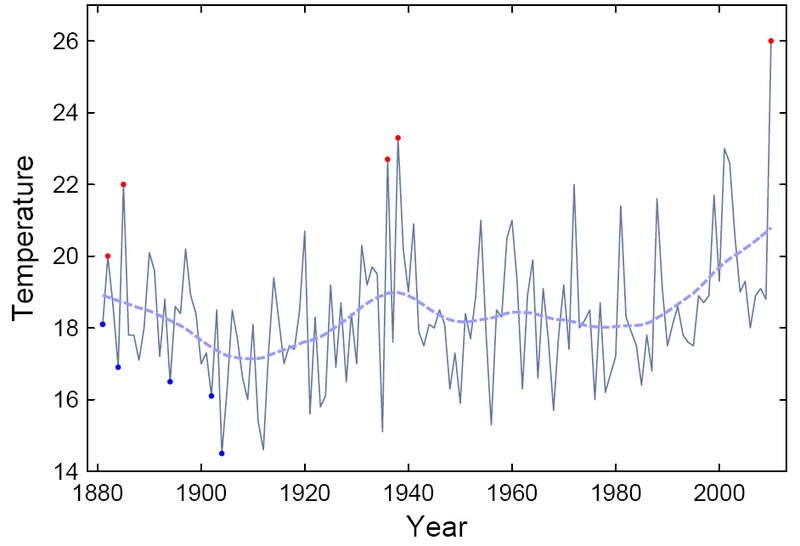 Short-term variability thus decreases the number of heat extremes, whereas a climatic warming increases it. For extremes exceeding a predefined threshold, the dependence on the warming trend is highly nonlinear. We further find that the sum of warm plus cold extremes increases with any climate change, whether warming or cooling. We estimate that climatic warming has increased the number of new global-mean temperature records expected in the last decade from 0.1 to 2.8. For July temperature in Moscow, we estimate that the local warming trend has increased the number of records expected in the past decade fivefold, which implies an approximate 80% probability that the 2010 July heat record would not have occurred without climate warming. Thanks for the Newman paper! Very very nice.